Our Solar System has its own Hoth: Europa, the ice-covered Jovian moon where the existence of alien life hasn’t been ruled out. Unlike on Hoth, where life thrives on the icy surface, life on Europa would thrive in the ocean beneath its frigid surface — but evidence for it might be just beyond the reach of our experiments. If life exists somewhere, it should leave behind some chemical sign, or a biosignature, showing the presence certain kinds of molecules. Plumes of gas shooting from the cracks in Europa’s surface could contain these signatures, but so might the surface itself, according to new research. Those surface biosignatures would just need to survive Jupiter’s intense radiation. “Our results also show that amino acids, although heavily reduced in concentration, would persist at detectable levels ... over 10 million year timescales at 10 centimeter depths even in the harshest radiation environments on the surface of Europa,” the researchers write in the paper, published today in Nature Astronomy. Here on Earth, there’s plenty of life that thrives in a rather alien way, powered not by the Sun, but by heat and chemicals rising from the ocean floor. There’s evidence that Europa has a water ocean beneath its ice (as noted by observations from Hubble and other spacecraft). Maybe that water hosts life similar to the kind that thrives in Earth’s oceans. 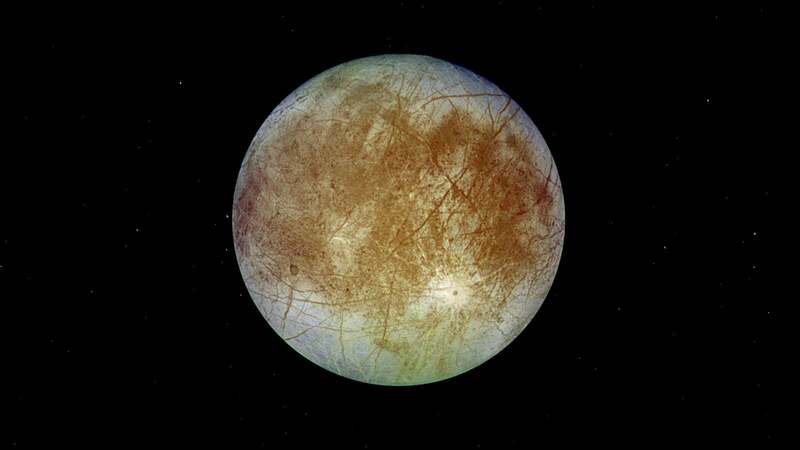 Researchers need to figure out a way to spot this life, and are working on a Europa clipper that would fly through Europa’s plumes. But material from the ocean might transport to the surface, perhaps through those plumes or from the ocean melting and re-freezing. A team from NASA’s Jet Propulsion Laboratory and Johns Hopkins’ Applied Physics Laboratory calculated whether life-indicating molecules such as amino acids on the surface would have to survive an onslaught of radiation from Jupiter’s harsh magnetosphere. There’s a magnetically active region around Jupiter wholly inhospitable to biology, let alone our own science equipment. That magnetosphere accelerates high-energy particles that could destroy the chemical evidence of life that our probes might look for. Using past data of how amino acids can survive radiation when frozen in ice, along with data about Europa’s harshest radiation environments, the team figured out where the amino acids would most likely survive. Life hunters might find biosignatures 10cm below the surface, albeit in reduced concentration, anywhere on the planet, the researchers write. But they could increase their chances should they analyse younger ice (as in, 10 million years old) in lower-radiation locations. Such ice would exist in Europa’s mid-to-high altitudes, further from its equator, where the moon points away from Jupiter, the researchers write. This is just a model; it will take a trip to Europa to determine whether there are truly signs of life beneath its surface. A Nature commentary by NASA Goddard scientist John Cooper points out that meteor impacts might break down some of those biosignatures, too — and that a lander will “be the final judge of whether we have been clever or lucky enough to find a biosignature, perhaps one taking refuge from radiation within reach under a small block of ice”. We don’t know whether there’s life on Europa, but scientists are hopeful. Whatever lander we send will just need to dig a little.